Everyone… I found the greatest beauty cleansing product of ALL time. I heard about this from Lily Pebbles a few weeks ago I believe from one of her favorites videos. Honestly I couldn’t fathom the thought that a cleansing oil would be more convenient and work more efficiently than a makeup removing liquid cleanser and a cotton ball or a makeup removing cloth BUT wow…all I can say is wow, wow, wow because this is the best thing I’ve ever tried and it makes me excited to have to take off my makeup because it doesn’t hurt my face; it doesn’t burn, it’s not hard, and it’s just so dang easy! You can find a your very own bottle of this stuff here and it’s even 40% off for the time being because the Body Shop is having a sale! It’s not an overbearing chamomile scent either, but a light fresh rejuvenating scent. I squirt one pump of the cleanser in my hand and rub my fingers together so I can get rid of all the makeup. I rub it in light circles (starting with my eyes) and continue the circular motion all over my face. It may make you look like a panda for a couple of minutes as it gently dissolves the mascara, eyeshadow, eye concealer, foundation and everything else especially around your eyes but it does just that…dissolves! 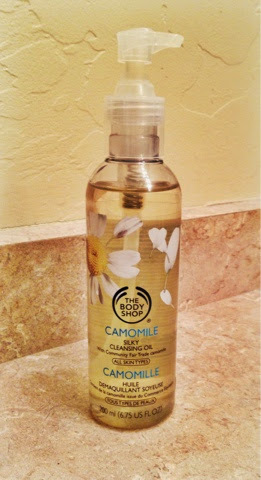 I don’t know how many times I can say this is the best beauty cleansing product out there. I hope you try this out and tell me your thoughts. What’s your favorite cleansing oil?